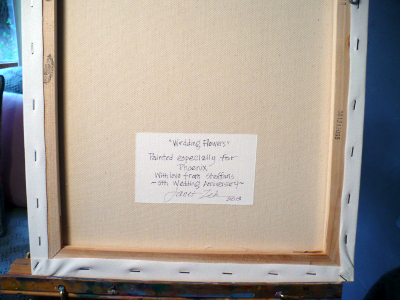 Zeh Original Art Blog Watercolor and Oil Paintings: Shipping a Wet Oil Painting on Canvas - How To Do It! 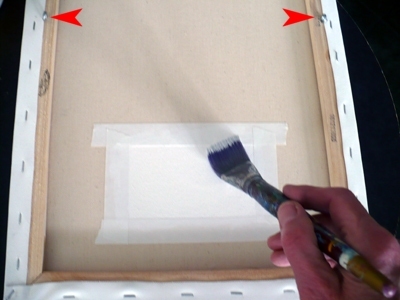 Shipping a Wet Oil Painting on Canvas - How To Do It! The next custom painting I am working on may need to be shipped before it is completely dry. OK, so how to do that? It's not difficult, but the key is, I need to know beforehand that the painting will be shipped wet and then take the proper steps before ever putting a brush to canvas. Many thanks to artists Jack White and Mikki Senkarik, for the idea behind my method. I'll show you the steps below. 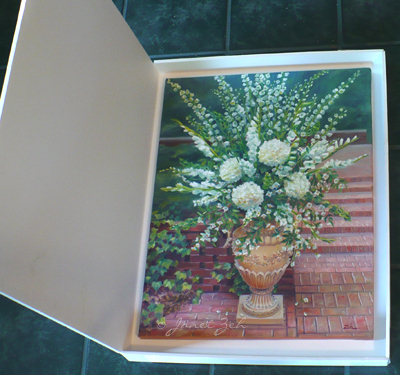 This works well for a small painting such as the one in the photo which is 18x14 inches. For a large work, the same idea applies, but heavier materials will be needed and the method modified. Step One - Prepare the Canvas: First, before doing the painting (if you have already done the painting, it is far too late!) I turn the blank, unpainted canvas face down and put two screw eyes in the back of the canvas stretcher bars where the hanging wire will go (see red arrows). Since this is a custom painting that will be personalized, I tape a rectangle on the back of the canvas, then paint it with gesso. 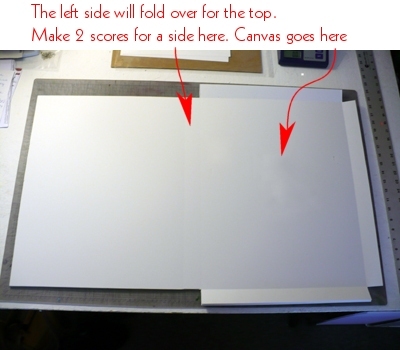 Step Two - Make a Box or Backing: Next (and this is the tricky part) I take a large piece of foam core board, measure, cut and score it to make a foldable box that the canvas will fit into (see below). 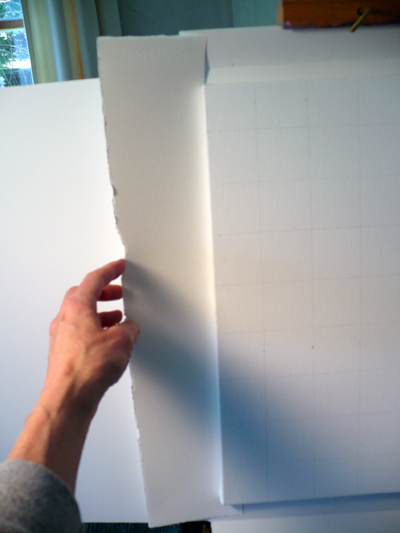 I leave extra room so the edges of the canvas will not touch the sides when folded. This is important, since the sides of the canvas will be painted. 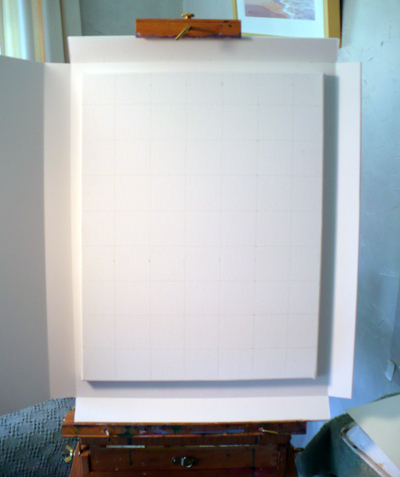 Also important is that the sides of the box are deeper than the canvas. So a lot of measuring is required. Which is why this part is tricky. Make sure to use a brand spanking new x-acto blade to cut the foam core! A new one will leave a sharp, clean edge. An old one will leave a ragged edge and you'll have bits of foam core stuck to your wet painting. You have been warned. In the middle of where the canvas will be, I tape a small baggie that contains wire for hanging and a picture hanger. This just happens to be a cozy, snug place to put this where it is out of the way and won't damage the artwork in shipping if taped well. 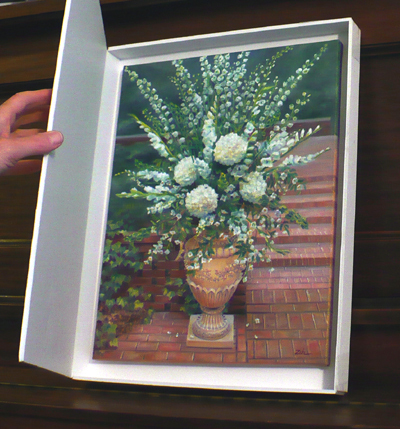 Now, if it were a large canvas, I would not do it this way, since foam core won't be big enough to make a foldable box. Instead, I would just use the foam core or heavy cardboard for a backing and adhere that inside a larger shipping box with reinforced sides. Step Three - Adhere the Canvas to the Foam Core Board: Next, I position the canvas where it will need to be when it is in the box. 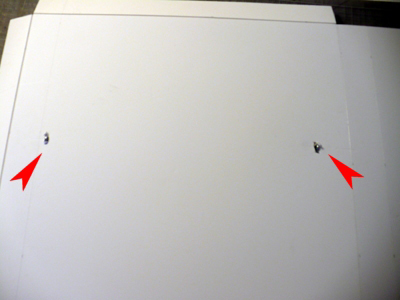 Then, I press hard on the area where the screw eyes are. This makes two dents in the foam core. I use my trusty, sharp X-acto knife to make holes where the dents are so the screw eyes can poke through. Bobby pins! 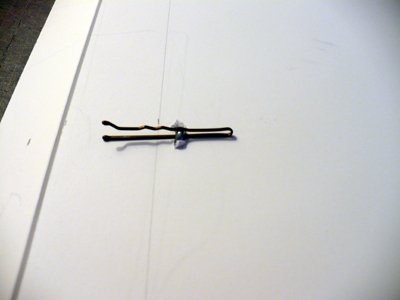 Yup, I stick a bobby pin through each screw eye to hold it tightly onto the foam core board. I tape them down as well, just to be safe. For a small, light canvas this size, two screw eyes work just fine. For a heavier canvas, three or four may be needed. The client can remove the extras after unpacking. I have made a pencil grid on the canvas to help with my initial drawing - it has nothing to do with shipping, so just ignore. 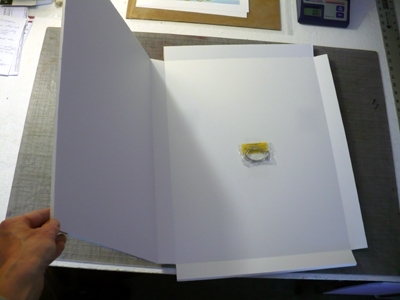 Step Four - Protect the Backing: One more thing is necessary. This canvas will have painted edges and I really don't want my beautiful foam core box to get all smudged up with paint. That would not be a very nice presentation, would it? So, I take some scrap strips of watercolor paper (any paper will do or cardboard) and slip it behind the edges of the canvas. This will protect the box. When I'm done painting, I just take them out and everything is beautiful! Step Five - Tape Up the Box and Ship: Once the painting is finished, all I have to do is fold the sides up and tape the corners, then close the top and tape it securely shut. Then I package it in a larger shipping box with extra padding and it will be on its way! Many thanks! This is a great idea, as I run/hike to my pleinair locations and need a way to get the wet oil paintings back to the studio. You gave me an idea of how to safely transport them on the back of my pack. You are welcome, Bruce. That is a great way to use this idea! 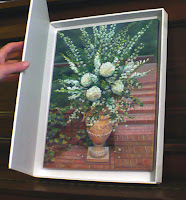 My students are now using it too for transporting their paintings back and forth to class. Thank you Bruce. Great video and I love how you are using the box with your back pack setup!